Bringing the Movement Against Corporate Power Back to the Streets! The Trans-Pacific Partnership (TPP) pretends to be a 21st Century Trade Deal. It purports to “open new markets and create new business opportunities” for all participating countries. But 30 years of neoliberal free trade is enough to show us these corporate rights pacts only benefit the elite and increase inequality. The TPP can only create new barriers to an alternative economic future where living well and protecting the earth are more important than corporate profits. It will undermine the ability of communities to collectively decide what is in their best interests. We can and must stand together against this latest corporate assault on democracy. On May 11, we can start to bring the anti-corporate globalization movement back to the streets. 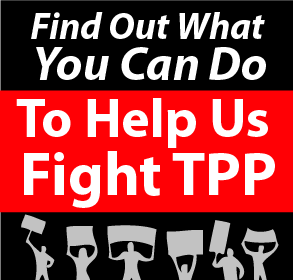 Hold community assemblies to discuss the problems with the TPP and the free trade model. Stage creative actions or stunts that draw attention to the TPP negotiations in Peru. Trans-national community resistance put a freeze on the WTO. It stopped the Free Trade Area of the Americas. It can stop the TPP. Activists should visit the website TPPxBorder.org for information about May 11th events already being developed, and to share information about events they are planning in their own communities. Can a “Dracula Strategy” Bring Trans-Pacific Partnership into the Sunlight?